Сервисом alaTest было собрано и проанализировано 4023 обзора для GoPro Hero 3 Black Edition. Средняя оценка этого товара 4.0/5, в сравнении со средней оценкой 4.1/5 для других Видеокамеры. Обозревателям нравится размер и качество изображения, портативность и удобство использования также получили хорошие комментарии. Были получены разные мнения о варианты подключения, кроме того есть менее положительные мнения о отделке и увеличении. Мы проанализировали оценки экспертов и пользователей, дату выпуска продукта и другие факторы. По сравнению с другими товарами из категории Видеокамеры, GoPro Hero 3 Black Edition получил alaScore™ 93/100 = Отличное качество! The GoPro Hero3 is a small camera that's designed to shoot high-resolution videos and be easy to use, however, for users new to GoPro, it's not exactly as simple as Felix Baumgartner jumping back to Earth. GoPro's flagship extreme sports camcorder is highly impressive. Supplied is a range of mounts, fasteners and adhesive pads. Our's came with the ‘Adventure Kit’ intended for use on dry land. Go for the Surf Edition if you're in and around water a lot. 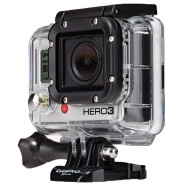 GoPro's Hero3 Black Edition is the most capable action camera available today. It gives users higher resolution and higher frame rate options than the competition, but its battery life leaves much to be desired. GoPro's Hero3+ Black Edition shoots the best 1080p footage we've seen from an action camera. Best video quality we've seen on an action camera. Versatile shooting modes. Capable of shooting 4K. Expensive. Battery drains quickly with Wi-Fi enabled. Poor still photo quality. Menu is still frustrating to navigate. Included is a handy remote that lets you control recording if the camera is mounted on, say, a helmet. The remote also changes modes, and it has large buttons to make it easier to use with gloves. It's a nice extra. The incremental update brings better Wi-Fi and battery life, a new lens, and a couple added shooting features, and keeps its predecessor's great video performance. The ; produces some of the best -- if not the best -- video we've seen from an action cam. Its abundant resolution and frame rate options will satisfy beginners and experienced shooters. GoPro's latest generation of sports cameras is its best yet, offering tremendous flexibility, proven durability, and some of the highest available resolutions and frame rates in the business. The ; is smaller, lighter, and features built-in Wi-Fi connectivity. The Black Edition offers a number of ultra-high-resolution capture modes and high frame rates for standard HD resolutions; burst speeds for still photos has been greatly improved. GoPro's control scheme has a longer learning curve than the simpler slide-n-go setup of the Contour cameras. Only 15fps on 4K video renders this selling point mostly moot for action videography. The GoPro Hero3 Black Edition delivers outstanding video quality and features like 4K that you won't find anywhere else. Excellent video quality. Versatile shooting modes. Rugged build with wide selection of mounts. Easy to use. Capable of 4K. Some issues with Wi-Fi. Pricey.